The key players in this burger recipe include sharp cheddar cheese, yellow mustard, Worcestershire sauce and bacon. (Everything's better with bacon, right?!) These ingredients are mixed in with the ground beef and formed into patties. You have the option to cook on a grill or even your stovetop with a grill pan. 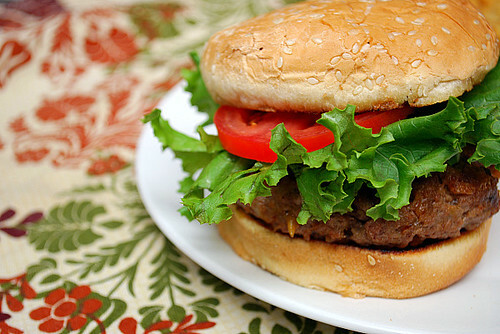 I found that these burgers were especially juicy, yet not greasy - and that's due to the use of 85% lean ground beef. There's really no need to top these burgers with anything else aside from lettuce and tomato because the bacon and cheddar cheese definitely shines through. A bonus is that it's not that messy to eat (as opposed to having the toppings on the burger.) You could also build from this recipe by incorporating firm cheeses, adding garlic, chiles and various herbs. However you decide to make your burgers, this is definitely one worth trying! In a large bowl, crumble the beef and add the cooked bacon, cheese, mustard, Worcestershire sauce, salt and pepper. Using your hands, lightly knead the mixture until combined. Divide the meat into 4 equal portions, then form each into a loose ball and gently flatten into a 1 inch thick patty. Cover and refrigerate the patties until the grill is ready. Place the burgers on the grill and cook, without pressing on them, until well seared on both sides and cooked through, roughly 8-12 minutes. Flip the burgers halfway through. Transfer the burgers to a platter, tent loosely with foil and let rest for 5 minutes before serving.